Once used primarily as a frilly garnish, kale is gaining recognition as an immunity-boosting, cancer-fighting cruciferous vegetable. Vitamins A, B-6, C, E and K are in kale's list of essential micronutrients. In addition to its vitamin content, kale offers dietary fiber, calcium, iron, manganese and a host of antioxidant phytonutrients. Steamed, boiled or sauteed, kale provides a wealth of vitamins to support your health. For 36 calories per cup, kale provides an abundance of vitamins that help to prevent disease, maintain healthy bones and tissues and assist with blood formation. One cup of chopped, boiled kale contains 885 micrograms of vitamin A, which exceeds the recommended dietary allowance of 700 micrograms per day for women and almost meets the allowance of 900 micrograms per day for men. Other antioxidant nutrients include 53 milligrams of vitamin C, 0.18 milligrams of vitamin B-6 and 1 milligrams of vitamin E. This serving provides 1,062 micrograms of vitamin K, well over the recommended dietary allowance of 90 micrograms for adults between 19 and 50. The vitamins in kale support a variety of vital functions. Vitamin A promotes healthy eyesight and tissue growth. Your skeletal tissues, skin and hair rely on vitamin A for renewal and repair. By maintaining the mucous membranes that line the inner surfaces of your body, vitamin A helps protect you against infection from pathogenic organisms. Vitamin B-6 helps your body to produce the antibodies that fight illness and promote healthy brain and nerve function. Vitamin C facilitates tissue repair and wound healing, boosts immunity and providing antioxidant protection against pathogens and toxins. Vitamin E also offers antioxidant protection and plays a role in the formation of red blood cells. Vitamin E enables your body to use vitamin K, which assists in blood clotting and bone formation. With its abundance of vitamins, kale deserves to be a regular part of your diet. The antioxidant properties of vitamins A, B-6, C and E may help your body ward off seasonal illness, as well as prevent chronic disease. Vitamins B-6 and C are water-soluble vitamins, which means that your body flushes away any excess in your urine rather than storing the nutrients for future use. 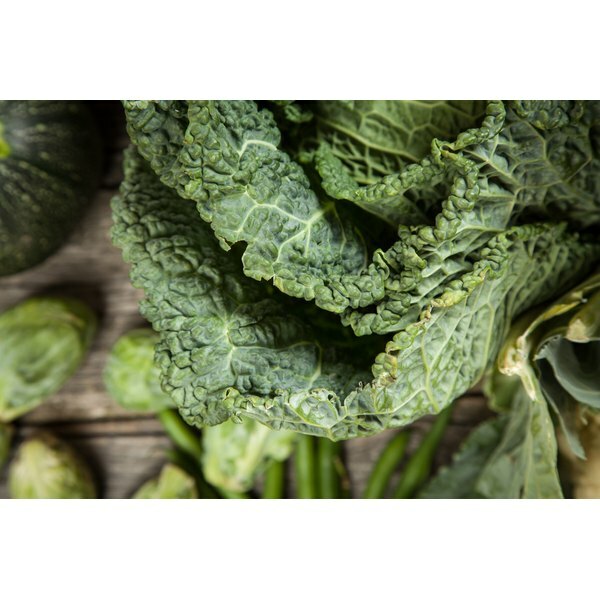 To fill your recommended dietary allowance of water-soluble vitamins, the University of Maryland Medical Center recommends eating a variety of nutrient-rich foods such as kale daily. The roughage in uncooked kale has a tough, spiny texture, which may explain why the vegetable hasn't acquired the popularity that it deserves. To soften kale's colorful leaves and optimize its vitamin content, steam kale in a steaming basket over boiling water for five minutes. Steamed kale can be seasoned with olive oil and garlic for extra flavor. If you're taking warfarin, a medication that thins your blood to prevent clotting, your health-care provider may advise you to limit your intake of kale and other foods high in vitamin K. Vitamin K's blood-clotting properties may interfere with this medications.